A country of 1.2 billion people and plentiful snow in the Himalayas will have just four athletes at the Winter Olympics. Worse, they won't be participating under the Indian flag. You can thank the corruption soaked Indian Olympic Association for the mess. Colonel C is a real army officer I’d rather not name. Among other awards he is the recipient of the Asiad Jyoti Medal for being part of the organising committee of the ninth Asian Games held in New Delhi in 1982. As a member of that elite group, he oversaw the construction of the games village in the city’s posh south. The colonel had hit pay dirt. At family dinners in later years he used to boast he had earned enough from the Games to ensure prosperity for seven generations of the C family. Sport in India has only a peripheral connection with athletes; it exists mainly to enrich officials, politicians, contractors and sundry parasites. Each individual sport is a milch cow to be milked dry by the mafia that controls it. Among the leading members of this mafia is the Indian Olympic Association (IOA). That the country of 1.2 billion people has continued to languish in the rankings netherworld in successive Olympics has never bothered the IOA. In fact, its crowning contribution is that in December 2013 India was suspended from the Olympic movement after tainted official Lalit Bhanot was elected secretary-general of the IOA. Bhanot was jailed for 11 months for corruption linked to the scandal-hit 2010 Commonwealth Games. It is clear that given a choice the IOA will place its officials’ interests over that of Indian athletes. The IOA initially preferred to stand by Bhanot at the risk of India becoming the first country to be expelled from the Olympic movement since South Africa was kicked out for its racist policies 43 years ago. Withdrawal of recognition means there is no national Olympic committee any more in India. “That means no participation, no subsidies,” said IOA chairman Thomas Bach. Indian officials are also banned from attending Olympic meetings and events. Under sustained pressure from the International Olympic Committee (IOC) and over 10,000 Indian athletes who signed a petition by Clean Sports India – which wants Olympic sports federations, associations and clubs in India to be managed by former sportspersons – the IOA decided to hold fresh elections and ban the tainted officials. But old habits die hard – the IOA in a churlish move decided to hold elections only late in February. That means the ban stays. While officials like Bhanot will miss out on business class travel and sundry privileges, it is the athletes who will be the worst affected. The fates of luger Shiva Keshavan, Himanshu Thakur (alpine) Hira Lal (cross country skiing) and Nadeem Iqbal (cross country skiing) remain uncertain. What’s certain is these athletes are barred from competing in Olympic events under their national flag. They can only take part as individuals. And if any of them wins a medal, the Indian national anthem will not be played. The worst case scenario is if the IOA somehow sneaks in the likes of the Bhanot and Suresh Kalmadi through the back door, the IOC will immediately de-recognise India. Stripping India of IOC recognition will keep Indian athletes out of the Olympics and related events such as the Asian Games. Other international federations may also de-recognise India. That the IOA would prefer to shield scam tainted carpet baggers than wipe the stain off India’s face is a pointer to the rotten state of affairs at the apex body. For, the likes of Bhanot are not your run of the mill corrupt official – they are several orders of magnitude worse. As the secretary general of the scandal soaked 2010 Commonwealth Games organising committee, Bhanot had brought international shame to India. Rejecting a complaint that sanitation at the athletes’ village was poor, he said due to cultural differences there were different standards of cleanliness in India and the western world. He was widely ridiculed for that statement but many media people in the Crown countries – who habitually heap scorn on India – latched on to his statement to highlight the appalling living standards of the country’s other half. Bhanot and his boss Suresh Kalmadi – who spent nine months in jail – are being investigated for illegally awarding a contract to Swiss Timing for the 2010 games at inflated rates, causing a loss of over Rs 90 crore ($14.6 million) to the public exchequer. That’s small change. For an event reported to have swallowed nearly Rs 70,000 crore ($11.3 billion) of public money, the total kickbacks and losses are likely to be a lot higher. Kalmadi’s successor Abhay Singh Chautala is no better. The Haryana legislator along with his father Om Prakash Chautala have been given 10-year prison sentences for illegally recruiting 3,206 junior teachers in the year 2000. The Chautalas are also responsible for the gravest incident of electoral violence, in 1990, and face a court case. It is appalling that the IOA, which had past presidents such as Dorabji Tata and Bhupindra Singh, the ruler of Patiala, is now headed by Abhay Chautala. The story of official stranglehold is the same elsewhere. The All India Tennis Association has been run by the same Khanna family for decades. Even great champions like Vijay Amritraj could not unseat this cabal. New Delhi’s premier tennis stadium, the RK Khanna Tennis Complex, is named after Raj Kumar Khanna, who never played tennis professionally. Before this family got a hold of Indian tennis, the country had produced a clutch of great players – the Amritraj brothers, Ramanathan Krishnan, Jaideep Mukherjee, Premjit Lal and Ramesh Krishnan. In 1966, 1974 and 1987 India reached the final of the Davis Cup. In 1974 it forfeited the match after refusing to play apartheid South Africa. Today India has no player in the top 200 in singles. 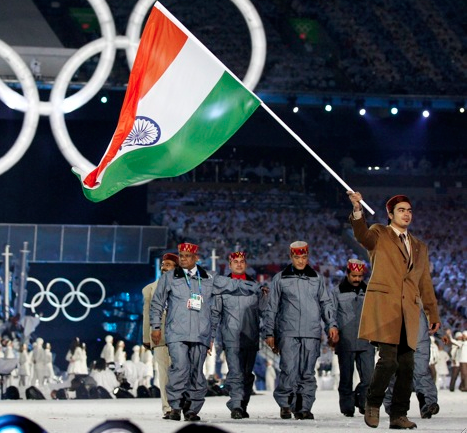 The popular myth about India’s lack of interest in the Winter Olympics is that India is a hot country. But India is also home to the highest mountain range in the world. Millions of Indians experience snow every year and half a dozen states abut the Himalayas. That leaves only one explanation for India’s virtual no-show at the Winter Games – wilful neglect. Keshavan, India’s sole luge athlete, will be competing in his fifth Winter Olympics. He does not have a coach, and depends on corporate sponsors and an internet fundraising campaign kicked off by his fans. While European and American athletes tote around in million dollar luges developed by racing cars companies, the Asia Cup gold medalist builds his own sleds with help from a roadside mechanic in Himachal Pradesh. This culture of neglect is ingrained in Indian sports. Back in 1997 when I went to pick up a friend who lived in the athletes’ quarters at the Yamuna Velodrome in New Delhi, I found her and her mother waiting outside with their bags all packed up. The friend’s mother, a Sports Authority of India official, had been asked to vacate the stadium for a few days because the huge stadium had been hired out for a Congress party political meet. What was really shocking was several archers who lived fulltime at the velodrome were also asked to find alternate accommodation. These archers – many of them young girls – came from distant villages in India and had no family or friends in Delhi to turn to. They did not have money either, and ended up sleeping at railway stations with their expensive gear. If India throws its athletes on to the streets, perhaps Indians shouldn’t expect them to bring home Olympic glory. We are going to remain a one-sport wonder, with cricket – played seriously by just eight nations – providing us champions. In India there is a saying that no matter what treatment you give it, a dog’s tail cannot be straightened. It seems the IOA will not take the straight and narrow way either. On January 11 Bhanot was incredibly the chief guest during the India-New Zealand game of the Hero Hockey World League Final being held in New Delhi. He was introduced to players from both sides as he shook hands with them before the national anthem ceremony. I hope the athletes later washed their hands with abrasive soap.